This question came from one of our favorite readers who is the head coach of a college club and competitor. As a reminder to our readers, we will answer any questions on all things fencing. We’re here to help! 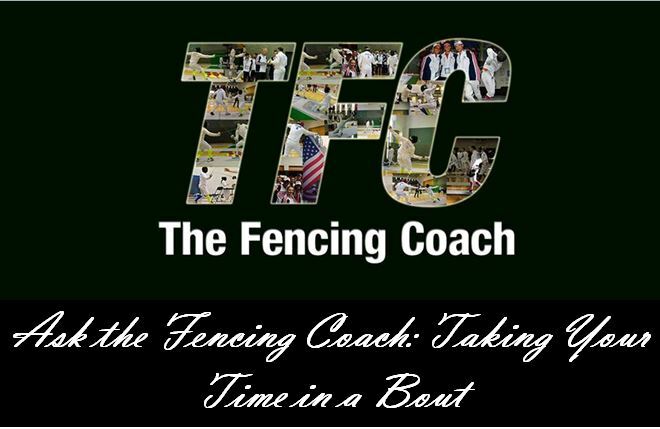 Question for you folks regarding something that is giving me issues as both a coach and a competitor: what do you do as a coach to teach utilizing the entire time during the course of a bout; what do you do as a fencer to drill ‘taking your time’ in a bout? The issue I am having is that I was taught crunch-time drills (you are down in a bout simulation by 3 and there is only 1 min left, or the reverse, for example), but have very little experience or resources with regards to “non-crunch” time drills. But as epeeists, you know that good things typically happen when you take your time rather than treating everything like the clock is going to turn against you like a rabid animal. Hopefully you all find this as interesting of a challenge as my fellow coaches and I are finding it to be. Thank you and, of course, thanks for the blog! Damien Lehfeldt: There are a few ways you can approach this. In an actual bouting situation, I tell myself to try to take 30 seconds to assess my opponents movement, distance variations, and general movement. It provides me with time to analyze my opponent, relax on the strip, and begin developing a strategy. This kind of behavior cannot be turned on a dime in competition, and it needs to be practiced as well. When you bout in practice, don’t go for the win. Try to practice with the mindset with which you will compete, and in your case, this means slowing down and taking your time. One other problem could be nerves. I see a trend in more inexperienced fencers that they tend to be a little more rigid and lacking patience during bouts. The less relaxed they are, the more likely they are to attack in single tempo without preparation and do so in a rushed manner. With experience in competition and practicing like you want to compete, you will be able to modify your behavior to transition into a patient and relaxed fencer. James “Jay-Dubya” Weiss: In my experience, 2 things typically work: a) I choose an attack, and repeat it as much as possible when appropriate (which works both ways – either leading or trailing) b) be aggressively defensive, I.e. Bait an attack by creating a chaotic environment, or enticing opportunity and draw the opportunity for a riposte or counter parry-riposte, and repeat. Like he said, staying simple through the appearance of complexity. To drill taking your time you need to practice having a specific plan in mind. Either this is a specific action that you have to create the prerequisites for before attempting, or it is a concept. You need to be patient in waiting for these prerequisites to be reached, otherwise your chances of scoring the action are significantly reduced. The easiest of those prerequisites is the 4th one, to stay in balance. So one can assume at any given point you have 1/4 prerequisites. Now you either wait for your opponent to attack or you work to draw them out. Drawing an attack out can reduce the chances of achieving #2, #3, and #4. Your best chance at achieving all 4 of the prerequisites is to literally sit and wait at the proper distance while being in perfect balance. Since epee is all about risk mitigation, this is the best approach if the score is tied or you are leading. To safely set up a feint-disengage attack you have to make sure your opponent has the immediate reaction to parry your blade. In epee most fencers will opt for a counter-attack when they are flat-footed. To achieve #1 you have to provide your opponent with a reason to defend themselves. Typically this is done with deep feints to the arm or body, or building off a previously successful attack. #2 is the easiest to achieve, as one can assume you are always in balance. #3 is optional, but it increases the chances of your feint-disengage attack dramatically because they will not have enough time to do a second parry or to counter-attack. I say it is optional because the distance dictates what type of attack (lunge, advance-lunge, fleche) you will do. You can do this feint-disengage from any distance. The best way to achieve all three prerequisites is to be in balance while pestering your opponent’s hand and pushing them into their end of the strip. If you can get them to the back of the strip and they have nowhere to go, they are flat-footed. Initiate attack. A specific action is a tactic, and a concept is a strategy. Those are two ways you can practice tactical training, and strategic training in the club. Pushing home the idea of taking your time to achieve hits in epee is crucial, as you only need to win by one touch. This makes your crunch-time drills all the more effective because with time running out and you holding onto a small lead, things can get chaotic but you will be prepared. ← The Alley, the Denny’s, and the Marble: a Plea to Cease Domestic Violence.